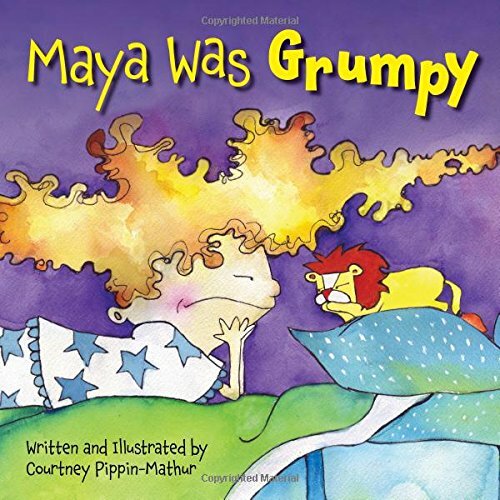 We’ve all had mornings where we got up on the wrong side of the bed, and that’s what happens in author/illustrator Courtney Pippin-Mathur’s uplifting new picture book Maya Was Grumpy. The book begins with a title page illustration of Maya peeking from under her quilt with a look of utter disgust, and from there young readers can easily see what kind of day it’s going to be for Maya. That’s right, Maya is feeling grumpy. She’s in a “crispy, cranky, grumpy, grouchy mood,” only she doesn’t know why she’s grumpy, and this makes her even grumpier. Since part of the mystique of feeling grumpy is the irresistible urge to share that grumpiness with the world at large, Maya does just that: snarling at the cat, making faces at the birds in the window, and even grumbling at her baby brothers. They all ignore her . . . which makes her even grumpier. When her smiling Gramma ignores her grumpiness (as grandma’s tend to do), Maya struggles to hold on to her sourpuss look. But her frown is no match for Gramma’s fun suggestions, which include hunting for hippos, bathing baby elephants and even tickling tarantulas until they giggle. Before Maya knows it, a tingling, tickly, bubbly sort of something—possibly a giggle—is working its way from her belly to her mouth and things suddenly don’t seem so bad after all. Maya Was Grumpy is laugh-out-loud funny and super-sweet. Ms. Pippin-Mathur manages to combine realism with fantasy by capturing the realistically sour expressions of a grumpy toddler and balancing them against a child’s boundless imagination. For example, there are adorable illustrations of Maya’s frowning face, downturned lips, and folded arms—all easily recognizable by the target audience of ages five and up. But there are fantasy illustrations, too: baby elephants in the bathtub, Maya and her family swinging on vines with monkeys, and Maya and her brothers tickling tarantulas with feathers. Perhaps the best drawings of all are the sidesplitting illustrations of Maya’s hair, a veritable explosion of frothy yellow curls that spreads everywhere and grows to incredible proportions at the turn of each page.